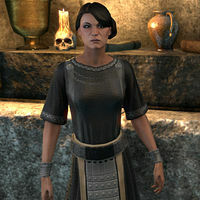 Lyra Viria is an Imperial and a former member of the Dark Brotherhood. While investigating the background of the Black Dragon, you will meet Lyra inside the Enclave of the Hourglass. Later on you will find out that Lyra herself is the Black Dragon. She was once a Silencer at the Blackwood Borderlands Sanctuary, and friends with Green-Venom-Tongue. During the quest A Ghost from the Past, you and Green-Venom-Tongue discover that Lyra was tasked with carrying out the purification of the Sanctuary. Subsequently, she was ordered to kill Primate Jonas, the predecessor to Primate Artorius. After that, Artorius offered Lyra to become his champion, the Black Dragon - an offer Lyra accepted. In The Wrath of Sithis, Astara will ask you to travel to Knightsgrave and ensure that Lyra is killed. In Knightsgrave, the Wrath of Sithis will appear and consume Lyra's soul. Dark Revelations: Investigate the background of the Black Dragon. Lyra also appears in the Dark Brotherhood card set from the story expansion The Fall of the Dark Brotherhood for Legends, as the card The Black Dragon.